I really love the base and the colorways of the self-striping Poste yarn created by Simply Sock Yarn Co. My craft room includes a fair number of fancy sock knitting books, but lately I just let the yarn do the talking via a plain vanilla toe-up pattern. Easy peasy. I favor primary colors, so these rainbow stripes are eye candy to me. Sometimes my camera does not pick up the different colors of self-striping yarn very well, so I tried a different background and a close up. Must work on my photo skills. Today may be the last day (fingers crossed) of wool sock weather. We didn't have much of a winter, so the hand knitted sock collection didn't get its usual workout. Still, I'm ready for spring. As I've said before, my sewing skills are minimal, but I do find sewing by hand to be somewhat relaxing. "Somewhat" because of that lack of skill. Who takes three yards of thread to sew on three tiny buttons? Moi. This little bear kit was purchased from the face painting lady who pops up at most of the local farmers markets. I thought it would be simple enough for my 6-year-old granddaughter to manage, but that was overly optimistic of me. She came across the kit recently and begged me to complete it. G'daughter has the pukes today, so I hope this gift will cheer her up. I'm not much of a seamstress, but I figured I could sew the output from learning to weave on a triangle loom. Besides, I planned to felt the bag, so expected any "quirks" to be hidden. And that is what happened. 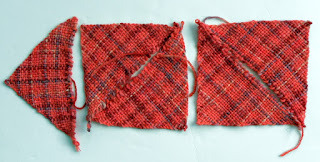 I used what I guess is called a running stitch to join two pairs of triangles to form the front and back of the bag. I wanted something relatively invisible so the fabric would not look pieced. And that is what I got (after felting). To join the back and front, I used blanket stitch on three sides. For the flap, I'm guessing the stitch I used is called overcast. Across the purse opening, single crochet provides reinforcement. Fringe finishes off the flap; in retrospect, I should have left the fringe longer. Five-stitch i-cord became the strap. I haven't felted much, but I remembered enough to put the purse in a mesh bag. Then I tossed it in with the regular laundry, intending to check on it after five minutes of agitation. I forgot all about it, so it went through the whole cold water wash cycle. I half expected the result to be doll-sized. 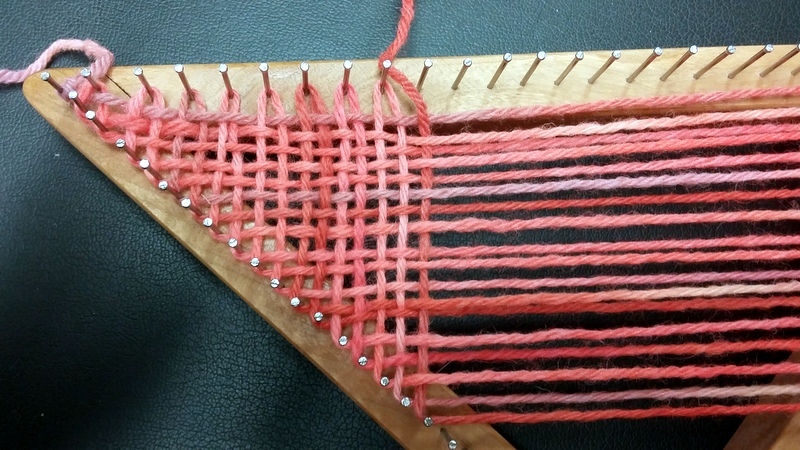 While the loom is ostensibly 8" on a side (okay, on two sides - the "top" is longer), the material contracts to about 7" when it comes off the loom. After my lackadaisical felting, the purse is about 6" on a side. Perfect for a six-year-old, me thinks. 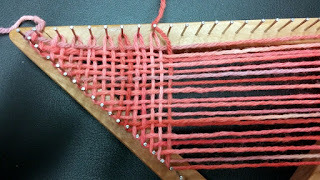 Weaving on a triangle loom is fast and easy. Doing something with the resulting triangles - not so much. A logical project seems to be dog scarves, but then one must figure out how best to attach the triangle to the dog in a canine friendly way. A bit short, so I made sure the next one, in i-cord, was much longer. This scarf is in the mystery yarn from class, which is a "heavy" worsted (aran?) On the loom, the weave looks rather open, less so when it comes off the loom, then even less so once soaked and blocked (and I use "blocked" rather loosely in this instance). The strap is 3-stitch i-cord, which is a bit tedious to knit, but definitely one solution for tying a scarf on a dog. My daughter is the one who likes to dress up her dogs in bandannas, so I am going to let her product test these versions. There is another scarf in progress, which I hope to get to work with a D-ring closure. We'll see how that turns out. Dogs have weird bodies, yet we try to design sweaters for them that are based on sweaters for four-leggeds. And every dog body is different, so patterns invariably don't quite work. In these parts, it does get cold occasionally (although lately at unseemly times, like NOW), so those of us with short-haired dogs persist. Pattern: Big Penny Sweater, by Corrinne Niessner. Yarn: Lion Brand Wool-Ease Chunky, in "Denim"
Watson is a medium-sized dog, but the medium fleece jacket I bought for him, while long enough, does not go around him very completely, as he has a deep chest. So I knew I would have to make at least some modifications to the pattern. I started by mixing and matching the stitch counts for both sizes in the pattern, going for the smaller number for length and the larger for girth. And yet I still had to add inches to the girth while extending the back and also ending the main part of the body soon enough so that he doesn't pee on it. I didn't seam the top inch or so, as it is too bulky with his collars. My plan to reinforce the leg holes also had to be abandoned, as the holes are a bit snug and misaligned. At some point I will probably custom design a sweater for him, but since winter is almost over (DESPITE THE SNOW FALLING FROM THE SKY TODAY), I will postpone that project. Traveling to Portland (INDIANA) for the Jay County Fiber Arts Fest and Spin In is becoming an annual event. I don't really need more sock yarn (yet I bought some) or roving (yet I bought some, llama and yak and Shetland). 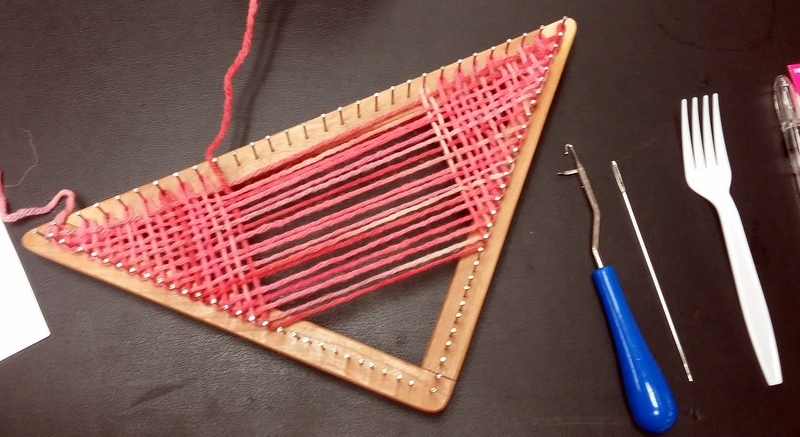 I certainly don't need another loom, BUT an 8" one was provided as part of a class I took on continuous weaving on a triangular loom. That was so much fun I ordered a larger 24" triangular one from the instructor (shipment TBD). 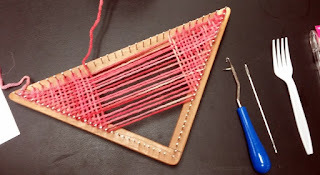 The materials fee for the class paid for not just a small loom but other tools necessary for weaving a triangle: a latch hook, a weaving needle, and a plastic fork, plus wool yarn. I made two samples in class last Friday, then the next day redid the first one (to eliminate those quirks) and followed it with three more, all in about an hour or so. 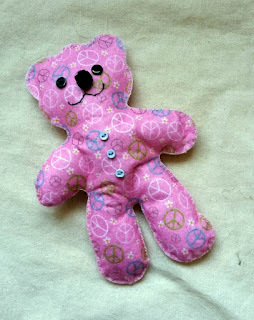 I plan to sew them together and add a strap, to create a cheery pocketbook for my granddaughter. 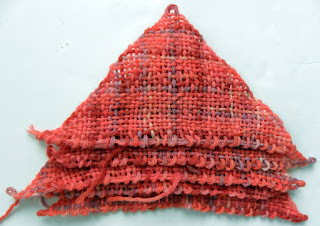 What else can you make with woven triangles? My first thought was kerchiefs for dogs, as my daughter likes to dress up her two pooches. With a large enough loom (the largest we saw adjusts from 3' to 7') one can weave large shawls all in one piece. 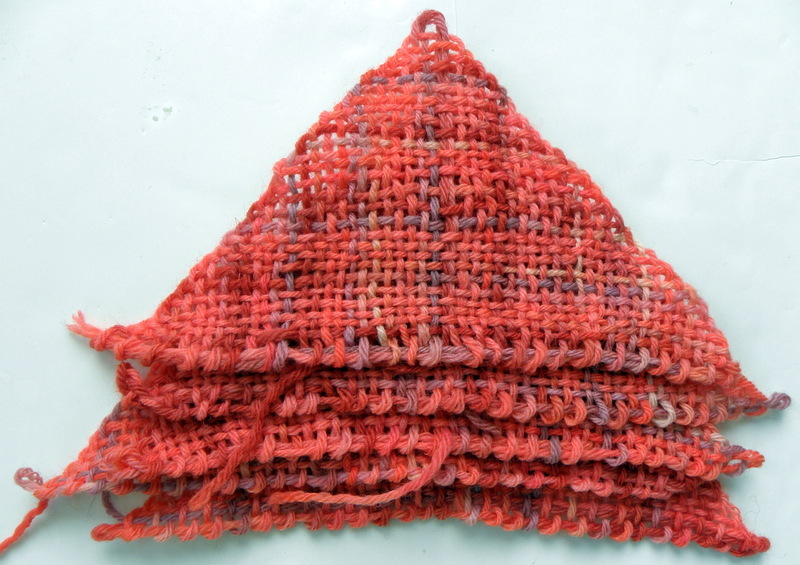 But actually, triangles may be combined in all sorts of ways to make a variety of objects and combined with knitting or crochet to make even more. One limitation is the fixed nature of the pegs, sort of like a rigid heddle loom with only one heddle. But like I said, it's fun and easy. As I mentioned in my previous post about a dyeing workshop I recently attended, one of the dye sources was black beans. The sample I took away from class was a light blue, but the sample I brought home turned out light green. I'm guessing one of the wooden spoons was contaminated with copper (from the mordanting of a different yarn sample). The hibiscus tea flowers I brought home from the workshop were disappointing - the result was taupe. The photo below shows undyed yarn lying on top of unmordanted dyed yarn. It is not a black-and-white photo. SO... I decided to overdye the yarn with henna, which I purchased at Fresh Thyme in their hair dye section. I chose the variety with only henna in it, using 4 ounces of henna for 8 ounces of Lambs Pride wool. Then I threw a couple of one-ounce skeins into the exhausted dye bath. The result is two lovely shades of brown. After "cooking" the henna, I strained the dye bath through some cotton cloth before adding the yarn. Since the cotton cloth was basically partially dyed from this step, I threw it into the exhausted dye bath as well. The results were uneven (and more tan than this photo indicates). One thing I learned from this post-workshop experience is not to leave yarn in an eight-ounce hank when dyeing. I was too lazy to rewind it into two four-ounce skeins, but eight ounces is just too much wet wool to wrestle with, especially when rinsing, then spinning in a salad spinner. I considered experimenting with different after-dye processes, but by the time I reached this point, I was done with dyeing... for a while.